What’s worse than forgetting marshmallows on a camping trip, or for a barbecue, or that roaring bonfire? Depending on your circle of friends, you just might want to do a double check before leaving home. And, how good would s’mores be without a few ooey-gooey toasted marshmallows? Yes indeed. Kids, summer barbecues, and cookouts all require marshmallows. For as much ritual and fanfare that marshmallows tend to receive, there’s really not much to them. They are pretty basic. Take a little granulated sugar, some egg whites and gelatin, add a couple other pantry staples and you’ve pretty much got the makings for a heap of better-than-store-bought marshmallows. Have you ever wondered what keeps marshmallows from sticking together? Turns outs it is probably a just a mixture of confectioners’ sugar and cornstarch (and probably some other preservatives). 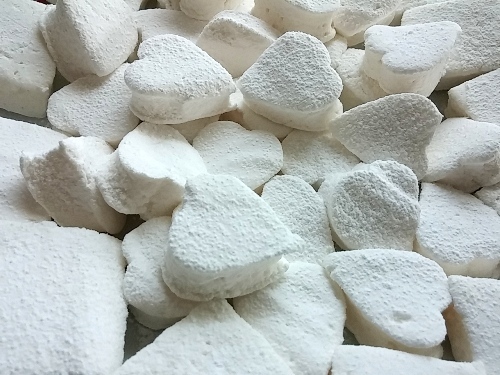 Marshmallows can be made without egg whites, but I’ve found that the egg whites provide fluffier and more stable results than those relying only on gelatin. I prefer David Lebovitz’s clever version that is based on the Italian meringue principle. Streaming boiling hot syrup into beaten egg whites further stabilizes them and also makes them safe to eat without further cooking. If you are interested in making a batch, the biggest effort will be in figuring out your candy thermometer and keeping an eye open for the syrup to reach the firm-ball stage, around 245 degrees F. At that point, when a bit of it is dropped into cold water it will form a firm but malleable ball when held between your fingers. Caramels are also cooked to this stage. While this is happening you will have beaten your egg whites into a thick and billowy mass. The syrup is streamed in, and then the dissolved gelatin is added, plus a bit of flavoring. It is all whipped for about ten minutes — enough time to beat the gelatin and egg whites into an expansive fluff. The final “cream” is spread out and left to firm up before it is cut, shaped, and dusted with the coating mix. Practice a little sugar and egg alchemy of your own, and you too, will hold one of the magical secrets of happy camping. Sift together the confectioners’ sugar and cornstarch dusting mixture. Butter a rimmed 8×10″ pan and sift a generous layer of the mixture onto it, leaving no bare spots. Set aside the remainder in a wide bowl. In a small bowl, sprinkle the gelatin over 1/2 cup cold water to soften and dissolve. In a small saucepan fitted with a candy thermometer, combine the granulated sugar, corn syrup and 1/3 cup water and set over medium-high heat. 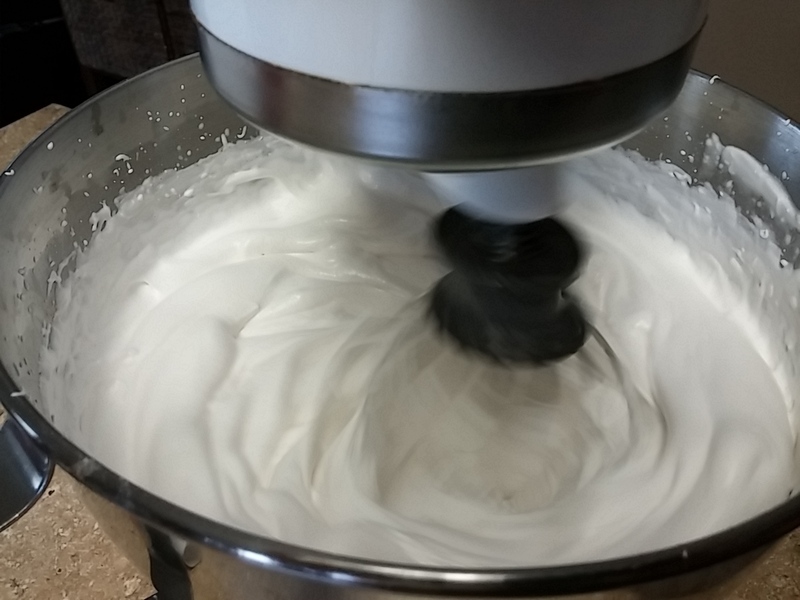 Add the egg whites to the bowl of a standing electric mixer fitted with a whisk attachment. On low speed, beat the eggs until frothy and add a pinch of salt. When the syrup reaches about 210 degrees F, increase the speed of the mixer to high and beat the whites until they are thick and fluffy. When the syrup reaches 245 degrees F, with mixer running on high speed, slowly pour the hot syrup onto the side of the bowl into the whites. Note: if the whites become thick and fluffy before the syrup is ready, stop the mixer and wait for the syrup to reach 245 degrees. .
Scrape the dissolved gelatin and water into the still hot syrup pan and swirl it to liquidize. Pour this slowly onto the side of the bowl into the whites while they are whipping. Add the vanilla extract and continue to whip for 10 minutes, until the mixture is completely cool when the outside of the bowl is touched. Use a spatula to spread the marshmallow “cream” into a layer in the pan. Dust the top lightly with the dusting mixture. Allow to dry for at least 4 hours, preferably overnight, uncovered. (It can also be piped or scoped on the sheet instead). To cut the marshmallows, use a pizza cutter or scissors (sprayed with cooking oil) into long strips or any shape desired. Place a few cut pieces at a time into the dusting mixture and sift more over them to coat completely. Shake the marshmallows vigorously in a wire strainer to remove any excess. 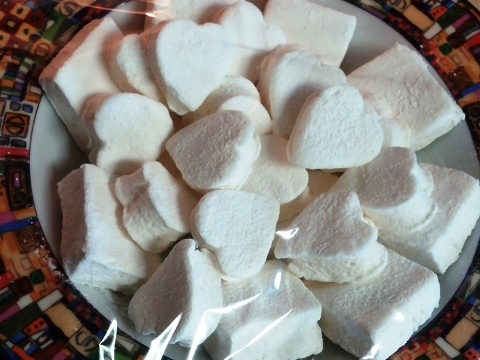 The marshmallows can be made up to one week in advance, and stored in an airtight container. Flavor with peppermint extract, orange or other flavoring and tint with complementary food dyes. Dust with colored sugar, dip in toasted coconut or melted chocolate. Package in gift bags with personalized bags of cocoa mix. Like everyone else in the country, my life is finally getting back to normal after early December’s subzero weather. Although the holiday season is certainly not ‘normal’, at least the major forces in my world are getting back on track. One of the first items on my agenda was to jump into the holiday baking. As a prelude to that, I pulled out my old madeleine pan (for new nonstick version check out the Fox Run Madeleine Pan) and baked off a batch of these sweet treats. No sooner had the warm liquid mixed with the crumbs touched my palate than a shudder ran through me and I stopped, intent upon the extraordinary thing that was happening to me. An exquisite pleasure had invaded my senses, something isolated, detached, with no suggestion of its origin. Yes, these are the things of which memories are made. Happy holidays. Often made with ground nuts, I prefer this simple version. Beat the eggs well and slowly add the sugar until mixture is thick and fluffy. Add the flour. Gently stir in the butter and grated lemon or ginger until completely blended. Chill if time permits, about 2 hours. Preheat oven to 350 degrees and butter the shells well or spray them well with oil. Scoop about 1-1/2 tsp. 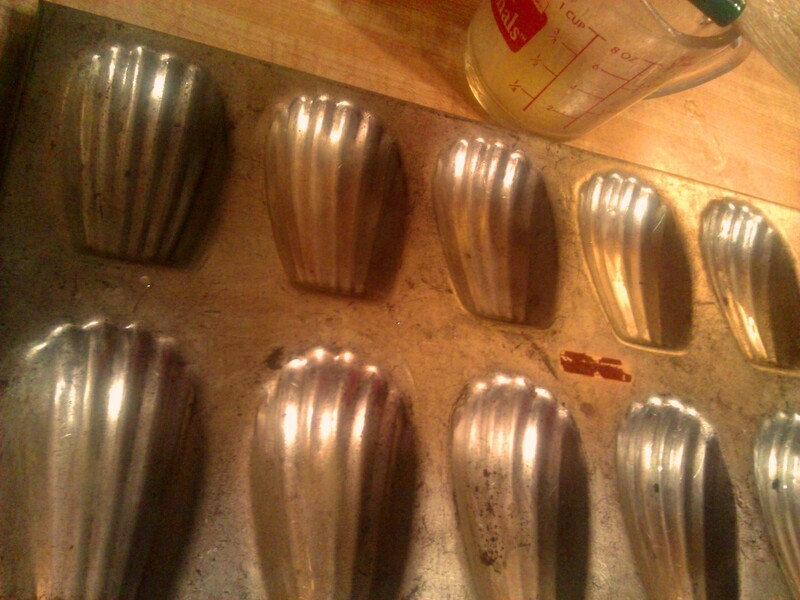 batter into each mold. Bake for 10 to 12 minutes, until the edges are golden brown. Remove from oven and let cool on rack about 5 minutes then remove from pans. Wipe out pan and continue. Yield: about 30. Dust with confectioners’ sugar. Best eaten the same day. Chocolate variation: Add 1 tablespoon unsweetened cocoa with flour; instead of lemon peel use 2 oz. grated semi-sweet chocolate.